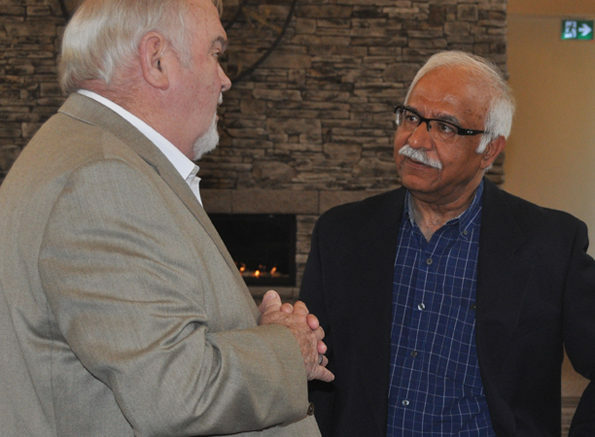 Dr. Ashok Chadha, right, discusses his vision for the Windsor Retirement Residence with Loyalist Township Mayor Bill Lowry at Thursday’s opening. Photo by Adam Bramburger. A local doctor is breathing new life into an Amherstview landmark with well-established ties to health and humanitarian care over a number of decades. Last Thursday, Dr. Ashok Chadha welcomed local dignitaries to the grand opening of the Windsor Retirement Residence — a building many recognized as the Religious Hospitallers of St. Joseph Regional House, but few could recognize once they stepped into the lobby. The building was raised in 1957 to house a convent of nuns from France that had come to Kingston to establish Hotel Dieu Hospital in 1845. The sisters moved to Amherstview from Perth Road to be less isolated. Over the years, some worked in hospitals and some taught in separate schools. Their home took on many communal uses. It housed weekly Masses for the local Catholic community until 1981 and more recently housed the Partners in Mission Food Bank and Meals on Wheels. In September 2012, the sisters stopped using the site and subsequently placed it up for sale. With strong demand for housing in Amherstview, Loyalist Township Mayor Bill Lowry said several developers expressed interest in the site but their proposals didn’t sit quite right. Lowry said most site plans involved simply tearing down the historic building and placing as many housing lots on the grounds as possible. In an area as densely populated as Amherstview, the site had high value. Some developers were discouraged with council’s hopes of preserving the site. One was not. Standing in the retirement residence Thursday, Lowry said it was 100 per cent the way the development had been proposed. He stated he visited the building often over the years and marvelled at its appearance. “Something I can relate it to is Hotel California. So many people have joked, ‘Where’s my room number?’ You feel like you’re in this wonderful hotel,” he said. Chadha said his desire to open a retirement home started with his career in medicine. He’d be doing house visits for senior citizens and going to residences that looked beautiful, but weren’t always functional. “They were not designed to take care of seniors’ needs, so it was this dream that brought me here,” he said. The doctor had a friend in real estate who knew about his vision and brought him to the grounds. He was discouraged to learn the property had already received two offers, but thought the sisters would like his plan. Chadha worked directly with his architects and designers, looking at the fine details. No expense was spared to find practical, safe furnishings. In the process, Chadha also showed his desire to maintain a piece of the community’s past. In an expansive upper library and chapel, the original altar and stained glass windows remain in tact. Outdoors, in spacious gardens, religious sculptures remain. The sisters visited in November when the project opened — delayed a year from original timelines. Chadha said his family invested a great deal in the project, but noted they’re pleased with the result. He’ll be able to keep a good eye on progress as Chadha will serve as a staff physician, on call regularly, which he says is a rare service the Windsor will provide that should positively impact an area with an aging population. The facility also nursing care available on need, meals, laundry, and recreational services. At present, there are 12 residents signed up and 10 who have already moved in. The home features 82 units with one guest suite and two rooms for respite care. Tracey Snow, a business development officer with Lennox and Addington County believes the home will be an economic driver in the eastern part of the county. Her own family is proof. While learning about the facility to help promote it, she brought her father on a tour and they fell in love with the building. He moved in.